Joachim Johannson. Will his huge serve lead to a breakthrough? It's a summer hardcourt tournament that brings out the celebrities in force. The history reaches back to the beginnings of the modern game. Past champions include virtually every legendary player of the last century: Bill Tilden, Ellsworth Vines, Fred Perry, Don Budge, Jack Kramer, Pancho Gonzales, Rod Laver, Jimmy Connors, John McEnroe, Stefan Edberg, Pete Sampras, Andre Agassi--to name a few. Is it the U.S. Open? No, it's the Mercedes-Benz Cup, at the opposite end of the country, at UCLA in Los Angeles, starting July 25th. The tournament dates back to 1927. It used to be called the Pacific Southwest. It was the biggest tournament in the west, going back to the day when we didn't live in a global village, and that meant something. It's steeped in tennis history, and this year the Mercedes has one of the stronger fields in awhile with Agassi, Roddick, and Lleyton Hewitt. To me, it's also a great place to see some of the less known and also younger players at close range. That's why I've gone over the past few years. Indian Wells is awesome, but there is so much going on there, sometimes there are 2 or 3 players playing at the same time. Then one of them loses and goes home. So the Mercedes is a great additional chance to film for Tennisplayer. It's also quite possible one or more of these guys could drop out--the players have a bad tendency of doing that at events below the Masters Series level--but the percentages look good for seeing a substantial number of interesting international players. The chance to see an international field with young stars like Mario Ancic. It may not be the best known fact in the history of the tournament, but Dr. Fox is a former Mercedes Benz champion. That was before the days of corporate sponsorship, when it was played at the legendary Los Angeles Tennis Club. The year was 1966. And the tournament was probably tougher to win in 1966 than it is now. It was held in the fall, the week after the U.S. Open, so the majority of the world's top players came west to play. The year Allen won, 8 of the top ten players in the world were in the field. It was the biggest hardcourt tournament in the world, since 3 of the 4 majors were still on grass, and Indian Wells and Key Biscayne didn't exist. You couldn't really make this up and have anyone believe it. You're right, it should be a movie starring Russell Crowe. In the last 4 matches of the biggest hardcourt tournament of the year, a psychology grad student from UCLA beat all four Grand Slam champions for 1966. Did I mention without losing a set? In case you're a little weak on your Slam history in the 60s, those four players he beat were,--in order--Manuel Santana (Wimbledon champ), Tony Roche (French), Fred Stolle (U.S.) and in the final, the great Roy Emerson (Australian). I asked Allen how he did this and his rather dry reply was "I was a little more dangerous on hard courts than most people gave me credit for me." He explained that as the tournament progressed, he found himself reaching a "surreal zone." The only PhD to win the Mercedes Benz, Dr. Allen Fox. "Everything seemed to be happening very slowly," he explained. "This may sound crazy, but against Emmo in the final, I was returning so well I remember thinking to myself, "Gee, I thought this guy could actually serve." Then there was his fabled tenacity and court coverage. In the last game, Allen ran down two Emerson crosscourt backhand volleys, starting from his own doubles alley, hit them both for winning lobs, and broke Emmo to win the match. How much would any tennis player give for a memory like that! He's told me the story a few times, but that's only because I keep asking him to repeat it. If you haven't read Allen's books and his articles, you're missing out. He has another Tennisplayer series that go into more detail what it was actually like to play against legends like Emmo, Laver, Stan Smith, Pancho Gonzales, and many others. (Click Here.) It's actually some of my very favorite writing on Tennisplayer, or about tennis period. And if you come out to the Mercedes this year on Tuesday July 26th, we've got something pretty special for you. A chance to meet Allen in person, receive a FREE copy of his new book courtesy of Tennisplayer, and, of course, get him to personally autograph it. For details, email me directly: jyandell@tennisplayer.net. The new book is called "The Winner's Mind." It's partially about winning in tennis, but mainly about winning in life. (Click Here to order.) So now you know something about the history of one of the great tournaments in American tennis history, and you have a couple of reasons for coming out to UCLA if you can be in the vicinity. To see some great tennis in person and to meet Allen Fox. There won't be another pysch PhD champion (since none are entered in the field) but you never know what you might see when you put that many good players in a confined space. Hope to see you there. Winning may not be everything, but Dr. Allen Fox points out that, if we are honest with ourselves, winning is still eminently preferable to losing. 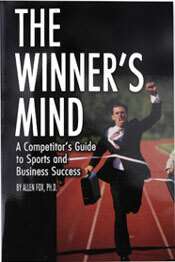 In his new book, The Winner's Mind, Allen lays out an original step-by-step plan for succeeding at any of life's endeavors, based on his first hand and very personal observations of the careers of both world-class tennis players and successful businessman. The bottom line is that even if you are not a born champion--and only a tiny percentage of us are--you can still use the success strategies of champions to tilt the odds in your favor. Writing with brutal honesty and dry humor, Fox lays out the common mental characteristics of winners in sports and in life. He explains the critical role of intellect over emotion. He analyzes the struggle between ambition and fear and the insidious and pervasive fear of failure that undermines so many of us. He then outline how to confront and overcome these fears in your life and career, even when they are initially subconscious. Must reading from one of the great thinkers in tennis, and a Renaissance Man in life. Click Here to Order.